Corning Cable Systems Model 340 OTDR PlusTM Multitester II offers true multitesting capability that features field-installable single-mode and multimode OTDR modules, visual fault locator, as well as optional built-in power meter and single-mode laser source. The standard unit provides internal solid-state memory for 125 traces and a floppy disk drive. An optional hard drive is also offered to allow mass data storage and speeds testing by eliminating the need to constantly exchange floppy disks in the standard drive. The product line offers a large variety of high-performance multimode and single-mode modules featuring a superior single-mode unit with 46 dB dynamic range. Three levels of SoftView emulation software provide desktop analysis and quality documentation capability. A large 10.4-inch (26.4 cm) display is easy to read and virtually eliminates the need to jump from screen to screen to view results. Because it is active matrix color, readability is further enhanced. The extraordinary strength, durability, and weather resistance of the custom polymer housing protects your equipment investment. Troubleshooting with the 340 is quick and easy with the SmartTest function. At the touch of a button, the 340 selects the parameters and then tests the fiber. The DualTrace function tests and displays both wavelengths on one graph. The multitasking operating system provides fast fiber analysis and data collection. The DualPulse feature allows measurement of the same fiber with two pulse widths to optimize resolution and distance measurements. Repetitive testing and documentation of each fiber is reduced to the shortest possible time using the AutoIncrement function. Only one button per fiber is needed to record both a trace and event table at each wavelength. Pop-up dialog boxes guide you from fiber-to-fiber and provide warnings if a fault of above-threshold loss is found. The 340 combines single-mode and multimode OTDR capabilities along with a power meter, visual fault locator, and stabilized single-mode light source into a compact platform that resides in a rugged polymer housing. Virtually any field testing can be accomplished with the unit. Capabilities include incoming reel inspections, link loss measurements, fiber attenuation (dB/km), splice and connector loss, reflectance and optical return loss measurement, length measurement, visual fault location and a 2 kHz test tone for fiber identification. With the many range and test options available, the unit can be optimized for telco, CATV or LAN applications. Specialty modules for water intrusion (1244 nm) and out of band (1625) testing are also available. Because the platform is modular and field-installed, OTDR options and VFL option not ordered initially can be added at a later date. The 340 is two OTDRs in one - single-mode and multimode - making it ideal for LAN testing, where both fiber types are common. With up to 46 dB of single-mode range available, the Plus II is a powerful tool for telco and CATV applications as well. The built-in power meter options make end-to-end testing easy because data can be saved to disk and analyzed/printed with the same software used for OTDR traces. For CATV applications, a range of +20 dBm is available. The VFL makes fault location within the OTDR's deadzone possible as well as providing visual continuity checks. Units equipped with single-mode OTDR capability can also be equipped to function as a stabilized laser source for loss measurement. Fiber identifiers such as the CheckPoint and CheckPoint Plus can recognize this tone to locate a fiber at a splice or repair point. 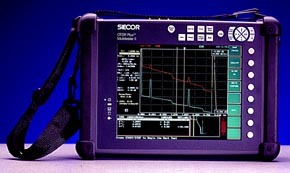 The OTDR operates as a simple fault locator. At the touch of a button, the unit quickly and accurately finds the end of the fiber. Think of SmartTest as the built-in expert. One key press will select the best parameters for the connected fiber, acquire the data, and present both a trace and an event table on one screen. Both novice and expert will benefit from quick and complete fiber characterization. For the novice, getting good results requires only minimal equipment knowledge. For the expert, SmartTest can quickly set machine parameters. On one screen, DualTrace characterizes a fiber at both wavelengths, optimizing the pulsewidth for each. Visual comparison of performance at each wavelength is greatly enhanced by combining both traces into one graph. Wavelength-dependent losses, such as bending and pinching in splice trays, tight bends in cable placement, and compression due to temperature extremes, are also easier to identify in the DualTrace view. Such events will exhibit greater loss at the longer wavelength, both on the traces and in the event table. A fiber is tested at a single wavelength with two pulse widths. Two traces are displayed, one for each pulsewidth. The short pulse provides optimal event resolution, while the longer pulse provides excellent distant measurements. Documentation of new installations and repairs is performed quickly with AutoIncrement. This function can create traces and event tables at both wavelengths, save them to disk, and prompt the user for the next fiber when ready. If any unacceptable losses are detected, the user is informed before proceeding. Sequential file names are automatically incremented for each fiber in the test. Data is stored to either the internal solid-state memory, a standard floppy drive, or an optional hard drive. Over 50,000 traces can be stored on the hard drive. Floppy disks may be created directly from the hard drive. Data can also be stored in other compatible file formats such as the standard Bellcore GR-196 format. SoftView emulation software (optional Level 2 and 3) turns a notebook or office PC into a fiber analysis workstation with powerful batch printing, reporting, and editing tools. Virtually all the functions available on the OTDR are available on the PC for data stored to disk. SoftView I, included with the mainframe, provides manual operation, view trace, two trace compare, and GR-196 measurements. Level 2 Software adds 8 trace overlay with save and recall, plus batch printing. Level 3 provides bidirectional analysis and global batch processing. This product is manufactured by: Corning Cable Systems. For More Information, call 1-800-743-2673. Distributed by Corning Cable Systems, 630 East Diamond Avenue Suite F, Gaithersburg, MD 20877. Phone: 301-417-9777. Fax: 301-417-9776.